The new edition of Corporate Accounting continues to provide a complete learning resource of the latest company accounting principles and practice. Written in teach-yourself style, the book offers panoptic coverage of the process of preparation of accounts and its presentation in conformity with the accounting standards and norms. It is enriched with illustrative examples and solved problems which makes it an indispensable text for the undergraduate students of commerce and management. Making it easier than ever, the book provides practical grounding of corporate accounting principles. 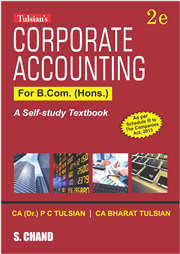 The book has been revised as per Schedule III to The Companies Act, 2013.